Betfair.com and Casinobonus.net are offering a 100% signup bonus worth up to £200 on initial deposits made at Betfair.com. In order to receive the largest bonus possible, be sure to enter bonus code CAS200 as you make your first deposit. Use the Betfair Casino Bonus Code above to get an exclusive 100% up to £200 deposit bonus! Using the bonus code CAS200 allows you to receive the largest allowable bonus from Betfair casino, which will increase your bankroll and give you access to all of the real money casino games at this casino. Betfair is a well known online casino that includes both instant play and downloadable casino software. The instant play software alone includes over 50 slots, 17 card games, 18 table games and a wide variety of arcade games and video poker variations. Customer service is provided through an FAQ, phone and email. 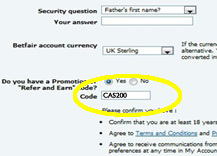 Remember to use our bonus code CAS200 when making a first deposit to ensure the largest bonus amount possible. The Betfair casino welcome program consists of a 100% bonus on your first deposit worth up to £200, followed by a 50% bonus on your second and third deposits, each worth up to 50 GBP. High rollers at Betfair can also take advantage of a 500 GBP bonus on any deposit in excess of 1000 GBP. Note that you must deposit at least 25 GBP to take advantage of this bonus. The bonus is exclusive to players from CasinoBonus.net who have never previously deposited real money into their Betfair casino account. Only one bonus is available per customer. You must take advantage of the second and third bonuses within one month of your first deposit. All bonuses have a wagering requirement of 20x the value of the deposit plus the bonus amount. You will forfeit your pending winnings as well as any remaining bonus funds if you request a withdrawal before unlocking your entire bonus amount. Slots, arcade games and Asian games, as well as some card games, contribute to the wagering requirement at a 100% rate. Blackjack, video poker, baccarat and craps contribute at a 20% rate. Roulette and Sic Bo contribute at a 50% rate. Be very careful to fully understand the regulations of the Betfair bonus code provisions so that you get full value for them. These are amazing bonus amounts that will let you play longer, and win more money for the cash you deposit into your account. Using Betfair bonus codes gives new players a real advantage in letting them comfortably play, learn the rules of the games they are playing, and develop their strategies that will serve them as they advance in their skills. Befair is a highly respected online casino that has great payout percentages. That means that along with the valuable Befair bonus codes giving you extra value, your winnings will give you the most value as well. Payout percentages let you know how much of your winnings you will have to pay to the casino. That is how they make their money. So, you see, online casinos don't mind if you win - they want winners. They take a percentage of each winning jackpot. You should always look for online casinos that have the best percentages, and our reviewers always make sure that the sites we list are the top of the line, with great percentages. We rate the Betfair bonus at 4.1 out of 5. Get started today, and win more for less money with the Betfair bonus code.